Some family pets clash. You might already have a cat, but your child wants a hamster. Cats love to catch mice and this means the hamster is tasty prey too. Do not underestimate the cat. To it, having a hamster in the house is simply a kind gift. Puss will monitor the situation until you drop your guard. Ethically, this is not fair on the poor hamster. Cats and hamsters have been known to coexist perfectly well in the home, but this depends on the temperament of the cat. So, if you decide to introduce a cat to a hamster, there are some precautions to take even if you think your cat is most friendly and accommodating. Keep the hamster in its cage for three to four weeks. The new hamster needs to settle in and get used to its new home. Being brought home from the store is a traumatic experience for a small animal because everything smells, looks and sounds different. The hamster needs to gain confidence and feel safe. Secure your hamster cage. Plastic acrylic cages are best with a cat in the house. Cages with bars provide little gaps for a cat's swiping claws to get through. The hamster could get scratched. Check every door and fixing on the hamster cage – all must be secure. When you are not watching, the cat will be looking for ways in. The smell of the hamster is too tempting to resist. Observe the cat as it watches the hamster cage. If it sits in a relaxed way, wagging its tail and gazing here and there, then you can feel confident that the cat is not too interested in the hamster. 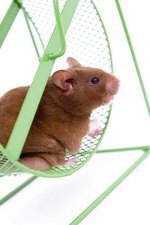 If on the other hand, the cat sits stiffly, with its nose at the cage, turnings its head quickly to follow the hamster's every move; then perhaps you should reconsider the introduction process. Your cat may have a very instinctive temperament and introducing it to the hamster could be dangerous. Show your cat that the hamster is a family friend. Hold the hamster in sight of the cat. Talk to the hamster and stroke it. The cat will hopefully notice that the hamster is important and that you have not eaten it yourself. Do this for a further two to three weeks. Always keep the hamster close to you and be constantly on your guard. The cat could decide to pounce. Repeat the process of holding the hamster when the cat is around. Move a little closer to the cat. So long as the cat remains cool you can continue. Be alert and on your guard. The cat naturally preys on rodents, so even if the cat looks happy, its mood can quickly change to that of a hunter. Stay in the room. Never leave the hamster alone with the cat because it is highly possible that without your supervision, the hamster will become food.